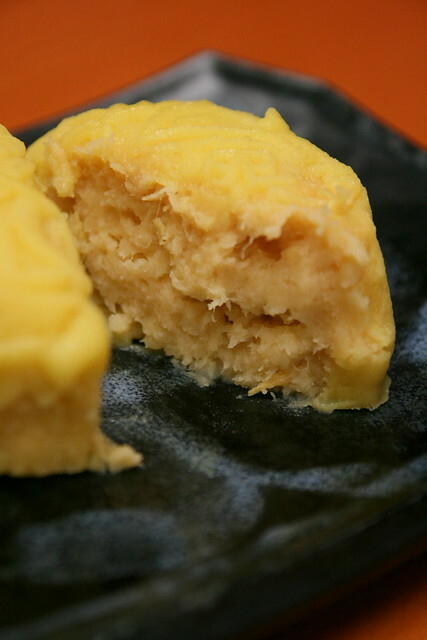 Man Fu Yuan is pulling out the stops with their "Mao Shan Wang" durian mooncake. The thick creamy durian pulp is made even more decadent with the addition of coconut milk. The snowskin covering is also so thin that it almost melts away under your touch. This photo was taken with the mooncake at near room temperature. The taste and texture seems to come out more when it's not chilled. It's available in a box of four pieces (S$54.80), or as part of the Snowskin Mooncake Collection (S$51.80) which also features Green Tea Paste with Dragonball Jasmine, Lotus with Macadamia Nuts and Sesame Paste with White Sesame Seeds. You can also mix and match your preferred flavours. There's a long rectangular box in front of the mooncakes that give you space for a tea sachet and set of plastic cutlery and napkin - so very thoughtful. Here's Nadine playing with the mooncakes. They also have the classic baked mooncakes. I should like to check out their unusual High Mountain Sweet Potato Mooncake with Champagne Chocolate, in boxes of eight pieces. It's a signature item they pioneered five years ago. But for now, the Mao Shan Wang durian piece has me purring most contentedly. 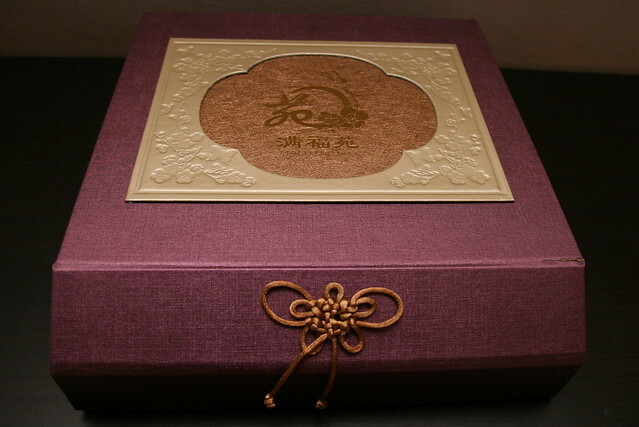 The boxes are so elegant and pretty, in muted gold and purple. These make such nice trinket or storage boxes. Mooncakes are on sale at the Teahut, located at the hotel's Bugis Junction entrance from 10 August to 30 September 2012, as well as at major shopping malls. Call 6820-8519 or 6820-8520 for more details. I didn't know that You can make cake from durian... I heart that this fruit smells very badly, but I even didn't see that in real life - only in books or Internet. Maybe in the future... Greetings for You from Poland.